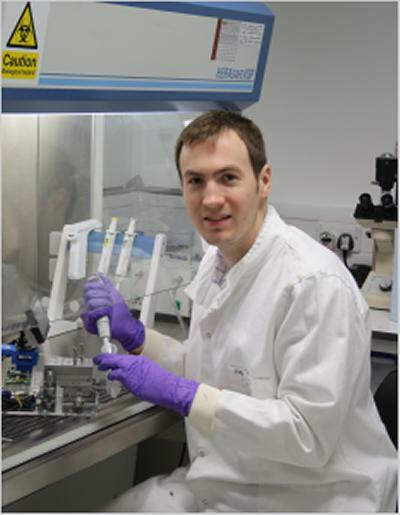 Dr Daniel Spencer is part of the Institute for Life Sciences at the University of Southampton. After completing a degree in electronic engineering and PhD at Southampton, Dr Spencer has been a lecturer in the Nano group of ECS since 2012. His research interests are in microelectronic and lab-on-a-chip systems for medical and healthcare applications. During his PhD, he developed microelectronic devices for high speed characterisation of biological cells and he is collaborating with industry partners to incorporate the technology into commercial devices. He has been exploring applying this technology to portable point of care diagnostic test devices, and has demonstrated CD4 count for HIV/Aids monitoring and for the characterisation of tumour cells. Dr Spencer is currently researching combining characterisation systems with sample pre-processing techniques for “sample-in, answer-out” diagnostic platforms. He is module leader for the fourth year Bionanotechnology course and lectures on the Lab-on-a-chip and Biosensors modules. He also supervises bionanotechnology based Part III and MSc individual projects. McGrath, J. S., Honrado, C., Spencer, D., Horton, B., Bridle, H. L., & Morgan, H. (Accepted/In press). Analysis of parasitic protozoa at the single-cell level using microfluidic impedance cytometry. Scientific Reports. Spencer, D., & Morgan, H. (2014). Single cell microfluidic impedance spectroscopy. Dielectrophoresis 2014, United Kingdom. Spencer, D., Elliott, G. R., & Morgan, H. (2013). Simultaneous fluorescence and impedance micro cytometry. Poster session presented at The 17th International Conference on Miniaturized Systems for Chemistry and Life Sciences (MicroTAS 2013), . Spencer, D., Hollis, V., & Morgan, H. (2012). Identification of tumour cells using microfluidic impedance cytometry. Poster session presented at NanoBioTech- Montreux, . Spencer, D., & Morgan, H. (2012). Miniaturised point-of-care full blood count. Poster session presented at Bringing Diagnostic Prototypes to the Point-of-Care, Kenya. Zmijan, R., Spencer, D. C., Mowlem, M. C., & Morgan, H. (2011). Differentiation of micro spheres by narrow angle scattered light detection on low cost PMMA micro flow cytometer chip. 1263-1265. 15th International Conference on Miniaturized Systems for Chemistry and Life Sciences, Seattle, United States.